Whether you’re renting a property, advertising your business or promoting a political candidate, you can quickly spread the word around the neighborhood with a yard sign. Easily affordable and simple to put up, yard signs are the perfect solution for making a personal statement or for advertising your business on street corners, work-sites, festivals, and outdoor events. 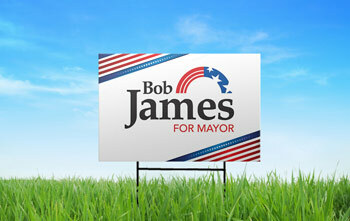 Standard lawn signs are available from NextDayFlyers in 12”x18”, 12”x 24” and 18”x 24”. All our waterproof yard signs are made from sturdy 4mm corrugated plastic (coroplast) and available optional h-wire stands that easily slide into the corrugated flutes for quick assembly and take-down. Yard signs are simple to order at NextDayFlyers! It takes a matter of minutes to upload your full-color designs and purchase your yard signs. Plus, you can have them delivered in a super fast 3 day turnaround! Start yours today! Got an open house? A quick way to tell the neighborhood and passing traffic about your open house is to put your details on a sign and place them by the roadside and in the yard of the property. Gardeners, pavers and landscapers can showcase their work with a site sign. This generates a lot of interest from neighbors and passers-by. Place a few yard signs down the street to let people know that you’re having a sale or opening a new business. Place lawn signs all over town to really get the word out. Changing locations is problematic for businesses. Business owners can avoid losing a lot of business by putting up “we’ve moved” signs at their old location to guide them to their new place of business. Inform visitors about your event and use them to guide people to your specific location. Create a series of directional lawn signs and place them on the route to your event. This is especially useful in big locations such as college campuses. If you have strong opinions on who should be elected as governor, school superintendant, mayor, or president then show your support with a yard sign. For local softball leagues, soccer leagues, football try-outs, and other sports sign-ups, a series of roadside signs will ensure your rosters are full! If you are supporting a charity fundraising event then a few lawn signs at key intersections will create awareness of your cause. Don’t rely on a flimsy piece of cardboard with marker scrawl all over it. Get more people to your sale with a clear and precise sign.. Put one at the end of your road and they will come. Whatever message you want people to see, make sure it gets the right attention with a yard sign from NextDayFlyers. We provide full-color lawn signs in a wide-range of standard and custom sizes that are both lightweight and durable. Order yours today! Yard Sign Printing is rated 4.5 out of 5 by 10. Rated 5 out of 5 by BucsRep from Above and beyond! I purchased a banner and yard signs but I was in a massive time crunch. The online chat representative went above and beyond to assist me and I received my items in plenty of things and the quality was great! I highly recommend and will be using again! Rated 1 out of 5 by Bill from Many Red Letters had obvious white areas in them I ordered 2 yard signs for a state fair display. Many of the red letters had areas, that you could see from a distance, where there was no red ink in some spots within the letters. I needed the signs for the next day at a state fair, so I had no time to contact the company to correct the signs. I colored the letters in with a red permanent marker and you could hardly see the defects. So if you are buying yard signs buy them long enough ahead to contact the company to have the order corrected. My 5,000 business cards and 5,000 stickers were 100% perfect. It was just the yard signs. Rated 5 out of 5 by LarsLanglo from Very happy with signs - pricing - delivery! Purchased a couple Real estate signs and some business cards. Was on another site and bailed because the design process was so difficult/buggy. Found this company in a Google search and within minutes my signs were designed and ordered. I will be back!